Ukraine has once again proposed to swap 50 separatists for 25 Ukrainians held by pro-Russian militants. 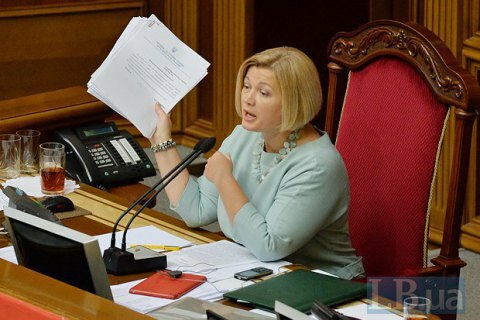 The release of hostages was the key issue on the agenda of today's meeting of the trilateral contact group on a Donbas settlement, Ukrainian first deputy speaker Iryna Herashchenko has said on Facebook. In particular, Ukraine is seeking to bring back Oleh Sentsov, Oleksandr Kolchenko, Mykola Karpyuk, Stanyslav Klykh and Oleksiy Chirniy, serving sentences in Russian prisons. On 15 June, the negotiators finally learned the whereabouts of Volodymyr Zhemchuhov whom Luhansk separatists accused of setting off a railway track near Lutuhyne and utility poles in Khryashchevate. Although Zhemchuhov had his leg amputated and has no eyes, he is kept in a remand centre and not allowed to see a lawyer. Herashchenko stressed that prior to the meeting in Minsk, Ukraine had proposed to swap 25 for 50 hostages to unblock the process. "In response we heard that UN representative Yuriy Suprun was convicted for military crimes (by what pseudo-court is a rhetorical question) and that historian Ihor Kozlovskyy was a spy who made munitions. The absurdity of these statements is obvious," she said. The 25-for-50 exchange scheduled for late April was disrupted.